This post covers week 13 and 14 which have been a mixed bag of success and downright disaster. Last week I finished the main body of the blanket. 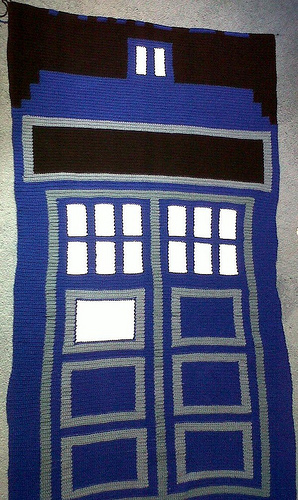 By the time I had added the word TARDIS it was finally long enough so I decided not to bother with the words ‘type 40’ as well. The final row count was 340. This would have been cause for much celebration on my part but, before I could enjoy myself, I got a stinking cold and spent three days wandering about feeling sorry for myself and not doing very much. (This is why I didn’t post last week. I was mostly sleeping and moaning.) 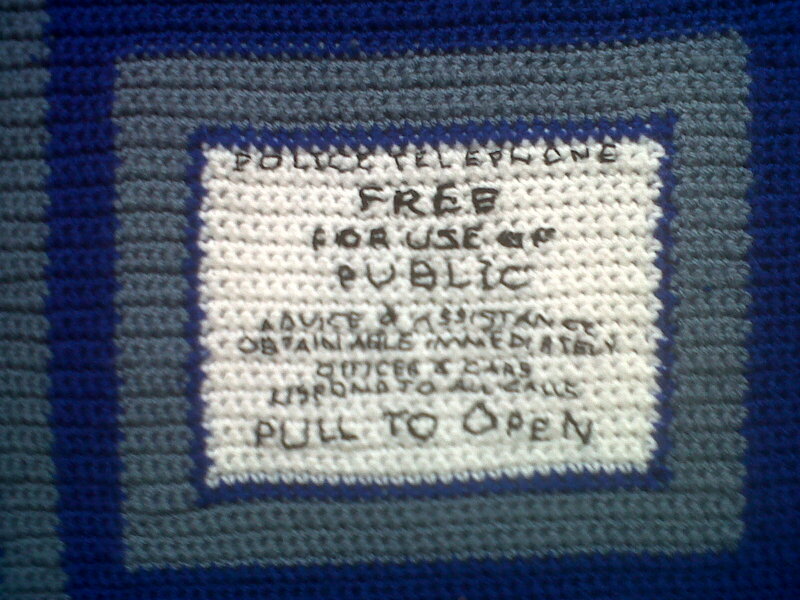 Once I was taking notice again, I leapt in and made a start on cross-stitching POLICE PUBLIC CALL BOX onto the sign board. As I said before, my plan was to use soluble Aida and charts. I had drawn the charts a few weeks ago and they looked spiffing so I got cracking. After the first row on the P, I stopped and looked and thought ‘Hmm’ but convinced myself that I needed to finish the whole letter before I judged. This was my first mistake. I finished the P and still wasn’t convinced but tried to tell myself I was being fussy and started onto the O. This was my second mistake. Three rows into the O, I stopped and admitted that it looked dreadful. 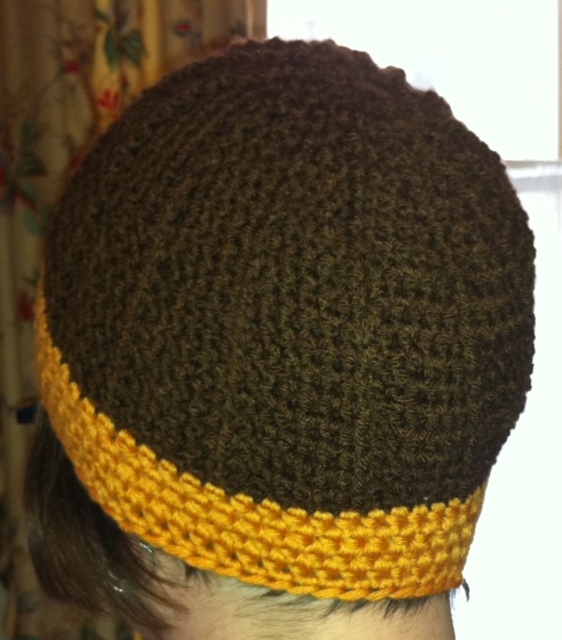 Despite the Aida, the stitches were really uneven which I think was down to the irregular nature of crochet fabric. I wasn’t even getting a clean edge on the letters. If I had stopped at the first row like my instincts suggested, I may have been able to unpick it. 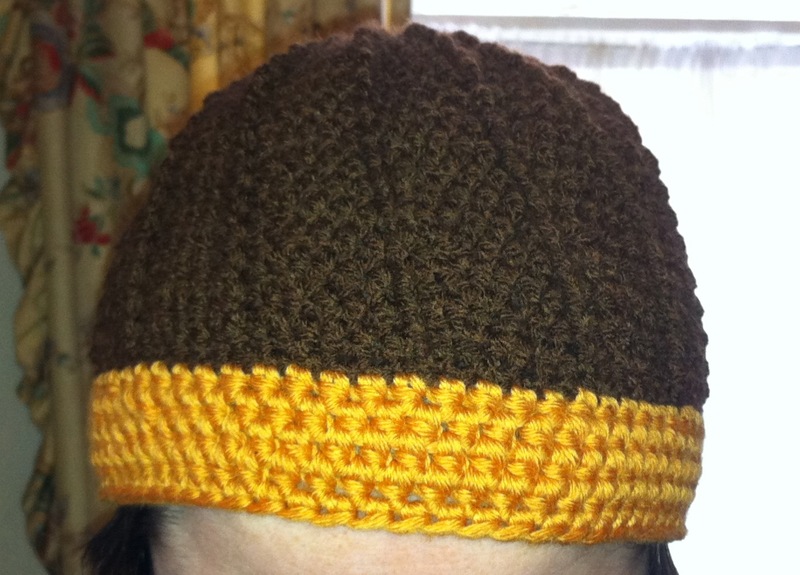 By the time I done the P and part of the O unpicking wasn’t an option anymore without running the risk of damaging the crochet underneath. The stitches were too small to get any purchase on without pulling hard. Chiz! Having spent a couple of days thinking that I had ruined the whole project and sulking, I was suddenly struck with the brilliant idea of appliqueing crocheted letters on instead. 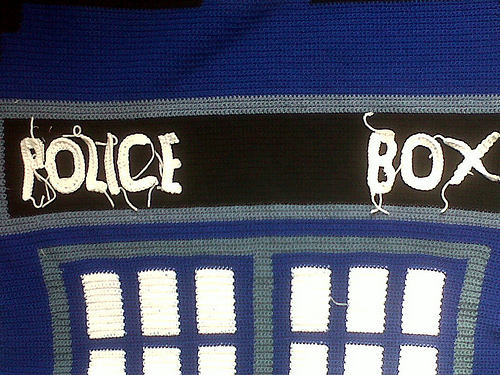 This means the letters looks even and they hide the failed stitching underneath. They also have the advantage of being really quick to make. An all round win, I think you will have to agree. 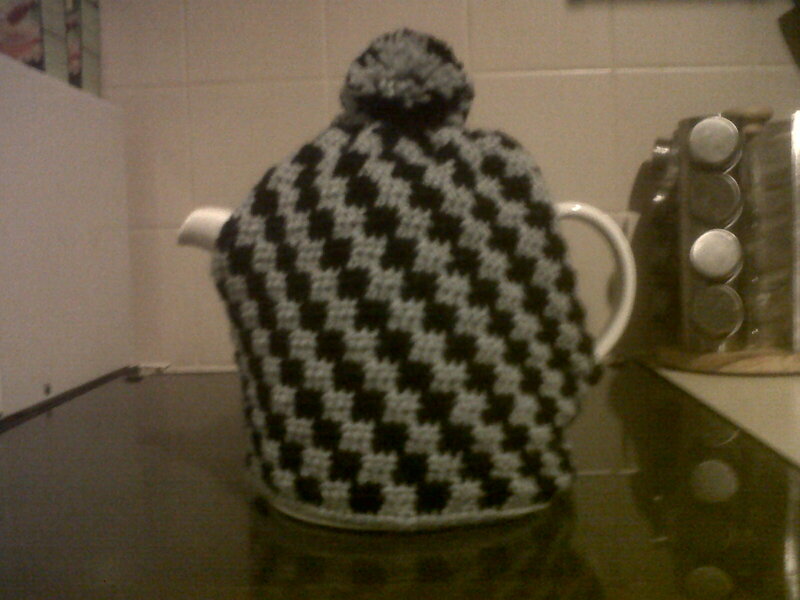 So I am back on track again – hurrah! I still plan to stitch the door panel but only in back stitch which I hope/think won’t cause the same problems as cross-stitching. The end is in sight. I estimate another 3 weeks will see this finished so I am already pondering what I will do next. This week’s quote is from everyone’s favourite tin dog. It’s not a TARDIS quote but struck me as so apt that it was begging to be used. Week 12 and the row count is 308. 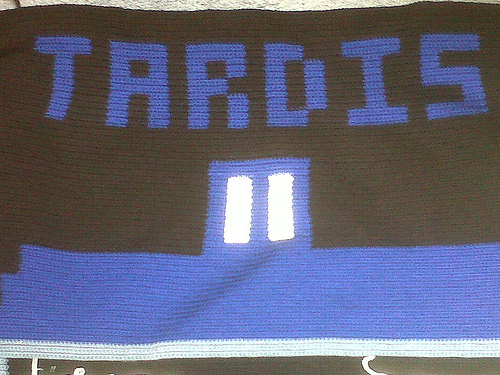 The actual TARDIS is complete but the blanket still isn’t long enough for comfortable snoozing. I had seen this coming and plotted a third chart a couple of weeks ago. 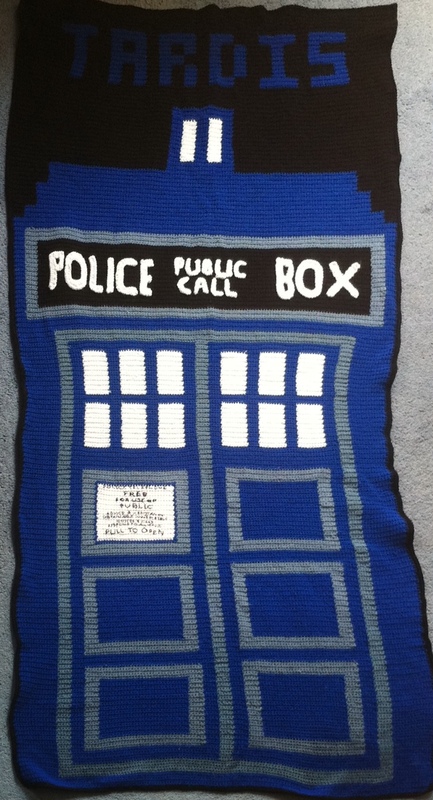 The new chart adds the immortal words Type 40 TARDIS to the top of the blanket and really should signal the end of the crocheting on this project. Phew! Click on the link if you would like a pdf of this part. Now officially too large to photograph well. 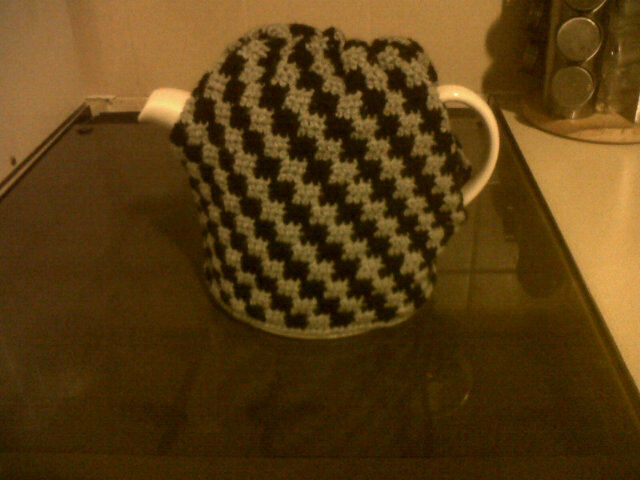 I have carried on practising my cross stitch this week and have completed almost one whole word. 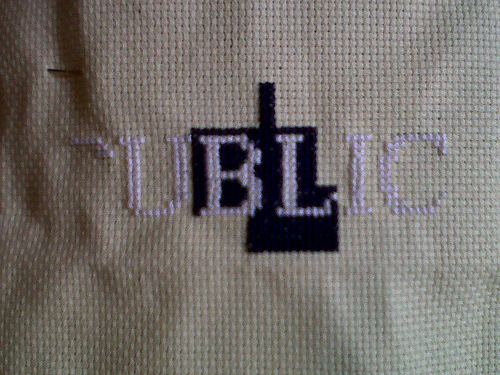 As I have only been stitching on the bus, I am not entirely ashamed of my progress. The plan is to eventually stitch the the whole of the door panel unless I run mad first. I have a feeling that this could be haunting me for years as my cross stitch concentration is never good. 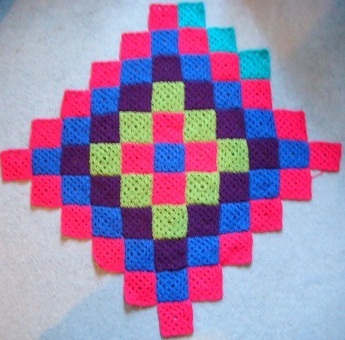 It is making me happier about stitching on the blanket though so it has already done some good. I am going to need a lot of blue thread. This week’s quote’s an easy one but I did have to watch 15 minutes of the requisite episode so I could take it down accurately. What a slog for me!